I haven't gotten a chance to watch the film yet. Will try to catch it in the next couple of days. If not, will do a video review when it's out. Meanwhile take a look at the external reviews and twitter verdict. sm63: Kashmakash - slow narrative. But nice change. Great feel of Bengal and India on 1920s. Continue to be impressed by Bengali art, cinema.. !! mastiii_channel: So... about the film #Kashmakash !Needless to say great #Story , Screenplay could have been more charming, actors are splendid though! CineMagik: Bloody awesome! 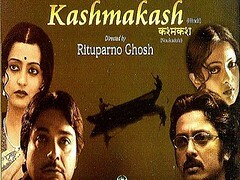 I bow down to the magician called Rituparno Ghosh #Kashmakash What storytelling! aninditaghose: Saw 'Noukadubi', the kosher Bengali version of 'Kashmakash' and it is stellar. No ambiguity about being a Rituparno Ghosh groupie anymore. Yay! Thumbs Up, by archana agarwal : Please watch it alone to see the beauty of movie. So-So, by seema sinha : This is just one time watch.Dont expect anything more than that. Rituparno ghosh is making some useless movies along with shyam benegal.They call these movies art.If you want to make art movie,please make them like bicycle thief. seema sinha has given this movie a So-So(This is just one time watch.Dont expect anything more than that.). seema sinha has posted 1 comments and has rated 1 movies. See seema sinha's page for more details. I liked the movie.Its one of btter movies made by rituparno ghosh. archana agarwal has given this movie a Yay! Thumbs Up(Please watch it alone to see the beauty of movie.). archana agarwal has posted 1 comments and has rated 1 movies. See archana agarwal's page for more details.